As children we have grown up believing in miracles. But seldom do we see them happening. Here is an extraordinary story of a visually challenged boy who has broken all stereotypes and created a world of inclusion that we strongly advocate. 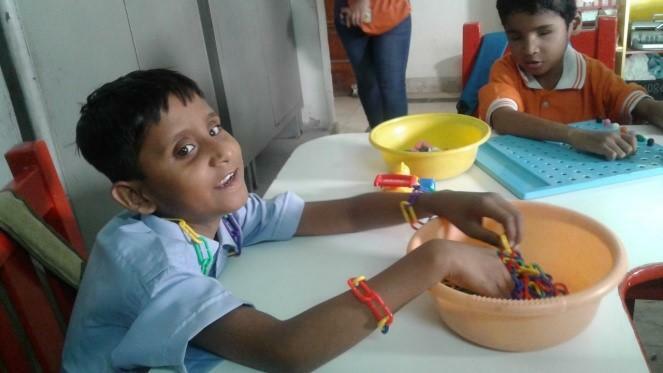 Hariom aged eight lives in the slums of Noida with his parents and sister who is also visually challenged. His father is a truck driver and mother stays at home to take care of children. Given their socio-economic background it was impossible for them to send Hariom to school. “My son couldn’t see but he was very sharp. I wanted him to study, and go to school. But we didn’t have money and resources to do it,” says her mother. In 2012 life changed for Hariom. He came to our partner Saksham where he was trained to read and write in Braille. Three years later with support from Tech Mahindra Foundation he joined Salwan Public School and since then has never looked back. Recently, he participated in Maths Olympiad and has secured 10th position in his school. It is really commendable because he competed with able students. We are with this young achiever at every step of the way.